My family and I made up 9 ppl and we had a very aggressive itinerary planned for 14 days. We were going all around Sri Lanka and were hoping to get a great driver and guide to make the process easier. 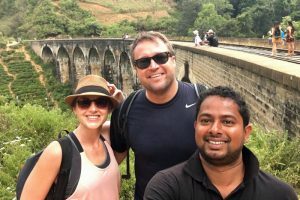 Thank goodness we booked through Rasanka at Sri Lankan dream tours, because we got so lucky!!! Our driver, Hamu and our guide “Wicky” were the most incredible and kind people anyone could ask for. They knew all the best shortcuts, and had all the best suggestions of where to go, eat and stay. They were the reason our trip was that much more memorable. They are truly remarkable people and we didn’t make their jobs easy by running around so much. They never once complained or said no. They were so accommodating for us and I am forever grateful. If you want an exceptional experience in Sri Lanka, please be sure to book through this company. You will not regret it. Thank you to Wicky, Hamu and Rasanka from me and my family! !